This month try Infusing Spirits! Slice off the Habanero stems & discard. Cut each Pepper in half lengthwise. Use the end of a potato peeler to remove the seeds. 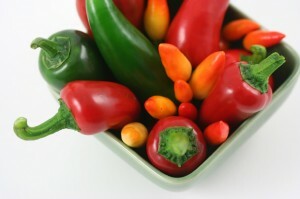 Don’t rub your eyes or your ANYTHING… these Peppers are hot! Chile Peppers… Add the Habanero’s. Seal the bottle. Store in a cool, dark place for 3 days. At the end of the third day, strain a ‘shot’ of the infused liquor through double layers of cheesecloth into a small glass. If you are happy with the level of infused heat, strain the remaining liquid, then return the infused liquor to its original bottle. It will keep beautifully in a cool, dark place that is until you drink it all! a Chicken Mole Pablano… I’ll practice on my Mole Sauce, then blog it for y’all.